For some time we’ve been expressing our belief that the secret to success in our work and personal lives is to surround ourselves with the best information and the best experts. And, although there’s a long way to go, the extent to which the developments in technology over, say, the last 25 years, have made this possible and is doing this, is, to us, nothing short of astonishing, particularly in relation to enabling us to surround ourselves with the best information in relation to health and wellbeing issues. Being able to do Google searches to get the best information in the way that we can is a huge breakthrough. And we’ve recently become more aware of organisations, many of them huge, that claim to do a better job than just carrying out Google searches does. The approach of these organisations, set out in this mission statement from the website of one of them is typical of their approach. We have started putting together a list of these organisations – use this link to see how far we’ve got with this. We’ve been particularly impressed with the organisation called Search GMX, which you can try by going to it’s website, search.gmx.net, and getting it to carry out a search on whatever you like, and the result may well work better for you and us than doing a normal Google search. But to us, these organisations are amazingly lacking in user friendliness and don’t work nearly as well as they could. One of them says that if we use their email form to send them a question, they MAY do some work on it, if it’s chosen, and MAY produce an article on it, which MAY be available in due course!!! We have a dream – that ordinary email addresses will come to exist that we can use to submit questions in relation to health and wellbeing issues to individuals and organisations, and (1) our emails will be acknowledged more or less immediately, (2) in due course, we will receive emails back letting us know whether they can provide help or not, (3) If they can’t, they’ll provide details of any other individuals or organisations who may be able to provide help if they can’t, and (4) otherwise they’ll provide us with the best information they know of. Perhaps such ordinary email addresses already exist? If any are known to any of our readers, we’d be SO grateful if they’d provide us with details on them, for our own use, and to be passed on to other readers. One of our readers reports that he has recently had difficulty going to sleep at night because he has so much phlegm in his throat and he just can’t get rid of. He says that there seems to be two facets to this problem – firstly, that his body is producing so much phlegm, he’s never experienced so much before, and secondly, that once there’s phlegm in his throat, there seems to be no way he can get rid of it. He spoke to his pharmacist and she recommended some cough liquid, but this hasn’t helped! And he sought the advice of his GP and she recommended an antibiotic, Amoxyclav AN 875/125, and this hasn’t helped! Our guess is that he could speak to dozens of pharmacists and dozens of doctors, and while they wouldn’t hesitate to recommend things, none of them would work – as they say, “Often wrong but never in doubt.” But we intend to follow this up. Our email sent to Ms King, the Shadow Minster for Health in the Federal Parliament, on 16 Aug 2016, still not even acknowledged yet, let alone replied to, despite reminders being sent to her. It appears that neither she nor her party has any interest in or concerns about claims being made that 360 patients are being killed in Australia by medical error EVERY WEEK! In terms of how we got on in our efforts to contact Hearing Life, it would be hard to imagine an organisation worse to deal with. It’s obvious that it’s management wants to avoid revealing any ordinary email addresses or putting anything in writing like the plague. We will write this up as time allows. National Hearing Care Claims to be “Australia’s largest independent hearing specialist, with over 20 years experience.” For more on National Hearing Care use this link. Hearing Loss Organisations and Associations A list of 26 organisations and associations mainly based in the US. CrowdMed – an exciting discovery? We’ve got not the slightest doubt that in the near future, if we have symptoms that are other than completely straight forward, we’ll turn to organisations like CrowdMed first to provide an accurate diagnosis of what we have rather than to a doctor or doctors – and perhaps we’ve reached that point already. We couldn’t agree more with this extract from an article on them. We’ve looked into CrowdMed to a certain extent – use this link to go to our summary page. But we intend to investigate them really thoroughly and add to this summary page as time allows. We don’t yet know what their fees might be – which may or may not be an issue. To us CrowdMed is a really exciting discovery. And what’s more, we’re sure lots of other CrowdMeds will appear on the internet as time goes by. A 25 Aug 2025 update: 360 every week being killed and 1,000 every week being permanently injured by medical error are pretty big numbers, wouldn’t you agree? You’d think that the politicians would be able to respond pretty quickly with what’s being done about it. Ha ha ha! Ha ha ha! Ha ha ha! Not very likely, with the likes of Catherine King anyway. We believe that we are on the verge of a similar revolution in health workers diagnosing health and wellness problems, treating them and providing information – that at present, in these things, we’re at the “walking behind a horse pulling a single furrow plough for 16 hours a day” stage. Things like Crowdmed and “Watson,” referred to in previous posts, are just the beginning. It would be interesting to know how “Watson” has progressed in the three and a half years since February 2013. We have not the slightest doubt that in the near future, if not already, if a patient gets a diagnosis from a doctor about which they have any concerns, if they get one which is different from a Crowdmed or a “Watson”, that the onus will be on the doctor to establish that they haven’t been negligent. 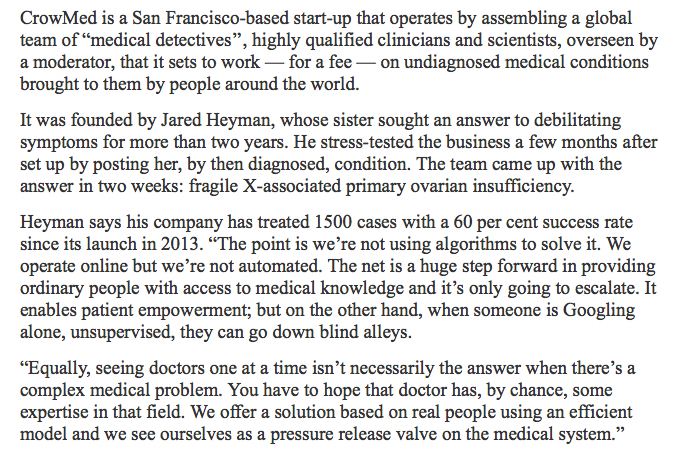 Perhaps there are already Sydney doctors working with Crowdmed and “Watson.” Are there?